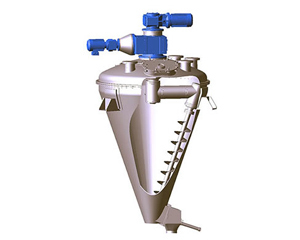 Conical Screw Mixer (or sometimes called Nauta Mixer) is a highly efficient vertical powder mixer with low energy consumption for batch mixing of powder and granule with various particle sizes. The Conical Screw Mixer is featured from the other mixing equipment for its very gentle mixing without any product distortion and minimal heat generation. NKM designs the CSM series Conical Screw Mixer with seals and bearings all mounted above the product level, thus there is no risk of lubricant contamination. 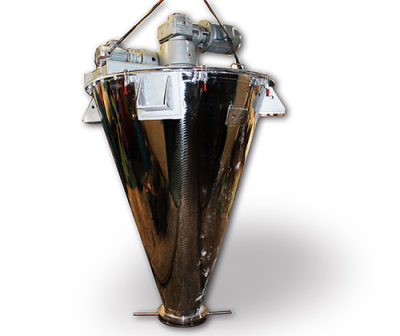 6) End products can be discharged completely without any residual in the conical container. 9) Double jacket is applicable for heating or cooling. 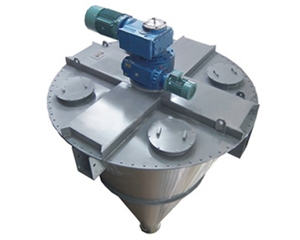 With optional vacuum execution the Conical Screw Mixer can be used as a Vacuum Drying Reactor. 10) Single screw or Dual screw is available depending on and materials to be treated. NKM CSM series Conical Screw Mixer consists of drive unit, conical vessel, transmission assembly, screws, and discharge valve. 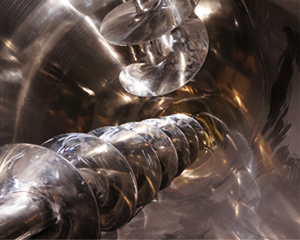 A spiral screw (or two screws, three screws according to specified application) is located in parallel with the conical wall with fine gap, and screw length is almost the same as the cone side. During the operation of the mixer, the screw is driven by the drive unit to rotate by its own axle, and at the same time, the screw also revolves around the center of the cone like a planetary. The self-rotation of the screw lifts the powder and granule upwards from the cone bottom to the top, and then the materials fall down by gravity; simultaneously, the revolution let the screw reaches every corner inside the cone without blind zone.